• Nanotech-grip: ein high technology sport grip for increased cue control. The brand "Bear" has been created 1994 by Dynamic Billard in association with the company "Falcon Cue Ltd." which was founded 1991 in Toronto, Canada. Shortly after foundation they built cues in association with big brands as "Joss" and "Predator". In just a few years they acquired a really good reputation in billiard scenes. Today "Falcon Cue Ltd." is known for high quality cues at affordable prices. Exactly these attributes are combined in Bear cues. In association with Dynamic Billard, a concept was developed which defines the excellent manufacturing, handling and quality of all Bear cues. Carefully chosen materials and the best "Canadian Maple" is manufactured to handmade cues, which will compete with every other brand. 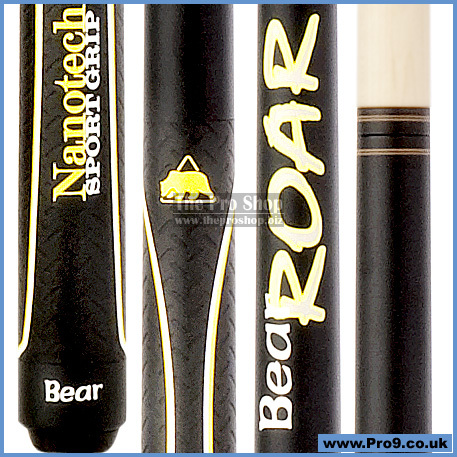 In cooperation with players worldwide the evolution of Bear cues steps forward. That is why the new series always fit the newest technical standards. This quality standard gets around in billiard scenes and a short time after the establishment of the brand a lot of top players changed to Bear in spite of a big competitive offer. Francisco Bustamante played with a Bear cue from win to win and 1999 he was elected "Player of the year". Since that time he has remained true to Bear and 2010 he became the World Champion for 9 Ball. The list of world class players, who trust in Bear cues includes Damian Massey (GBR), Radoslaw Babica (POL), Carlos Cabello (ESP), Ivica Putnik (CRO), Vilmos Foldes (HUN), Alex Borg (MLT), Bahram Lotfy (DEN), John Vassalos (GRE), Nico Ottermann (GER), Francisco Diaz Pizarro (ESP) and Francisco Bustamante (PHI) has used his Bear Cue for over 20 years now.